Different financial goals may require a different approach when it comes to saving. When you plan to use the money you're saving in the near future, a short term savings account can let you earn interest, while keeping those funds accessible. If there are money goals you want to achieve that have a longer deadline, a long term savings account likely makes more sense. As you're considering where to save, it's helpful to understand how long term savings account options compare. What Is the Definition of a Long Term Savings Account? In general, a long term savings account is designed for saving over an extended period. Depending on the account, there may or may not be restrictions on when you can withdraw the money, and some long term savings accounts offer tax advantages. These accounts allow you to capitalize on the power of compound interest over time. Compounding interest essentially allows you to earn interest on your interest. So, why would someone choose a long term savings account over another savings option? Assuming that you continue making new contributions to your account regularly, a long term savings account offers the potential for your money to grow steadily until you're ready to use it. Ideally, a long term savings account is reserved for funds that you'll need 5, 10 or more years in the future. Certificates of deposit or CDs are time accounts. This means the money you deposit must be held in the account until the CD reaches a predetermined maturity date. Once the CD matures, you can withdraw your initial deposit, along with any interest you've earned. CDs can have very short terms, of 30 to 90 days, but others can have terms extending up to 10 years. A CD may be a good choice if you need a long term savings account because you're saving up for something like a down payment on a home. One thing to be aware of with CD accounts is the early withdrawal penalty. Many banks assess a penalty, usually a percentage of the interest earned when you withdraw money from your CD ahead of the maturity date. One way to potentially avoid this penalty is by establishing a CD ladder, with CDs of varying maturity dates. This way, you have some predictability with regard to when you can take money out of your CD, without sacrificing interest earnings. Individual retirement accounts or IRAs are a tax-advantaged way to save for retirement. A traditional IRA offers the benefit of a deduction for annual contributions. This can be valuable if you're in a higher income tax bracket since deductions reduce your taxable income. A Roth IRA doesn't allow for deductible expenses, but qualified withdrawals are 100 percent tax-free in retirement. Withdrawing from an IRA before age 59 1/2 can trigger an early withdrawal penalty, similar to a CD. This 10 percent tax penalty can be steep, which is why IRAs are best viewed as long term savings accounts, not a source of emergency cash. Unlike a CD or a regular savings account, money saved in an IRA can be invested in mutual funds and exchange-traded funds. While IRAs carry more risk than CDs for savers, there's also a much greater potential for your money to grow if your chosen funds perform well. 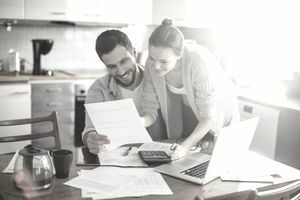 An employer-sponsored retirement plan, such as a 401(k) or a 403(b) is another long term savings account with tax advantages. Contributions are tax-deductible and compared to IRAs, the annual contribution limit is much higher. These plans follow IRA distribution rules, in that traditional 401(k) contributions are taxed at your ordinary income tax rate when you withdraw them. Roth 401(k) withdrawals are tax-free. What gives 401(k) plans an edge over IRAs is the potential to get an employer matching contribution. If your employer matches a percentage of what you put in, you're essentially getting free money to help fund your long term retirement savings goals. Another benefit is that your employer may allow you to take a loan from your 401(k). While this would have to be paid back with interest, the rate may be lower compared to a traditional loan. And you wouldn't pay a tax penalty as long as the loan is repaid in full during your employment or before leaving your job. Paying for college can be expensive, but there are two types of accounts that can help you prepare. A 529 college savings account allows you to contribute money on behalf of a qualified beneficiary, including your child, grandchild or even yourself. Those contributions grow tax-deferred, and withdrawals are tax-free when used for qualified education expenses. A Coverdell Education Savings Account works along the same lines. The difference is that a Coverdell ESA caps your annual contributions at $2,000 and no new contributions can be made after the beneficiary's 18th birthday. All money must be withdrawn from the account by the beneficiary's 30th birthday; otherwise, a tax penalty applies. 529 plans don't require you to make withdrawals according to a specific timeline. If you're using a long term savings account to plan ahead, there are a few tips to keep in mind to get the most out of your efforts. Be mindful of maturity dates with CDs. The penalty for early withdrawals can easily wipe out any interest you've earned. Compare interest rates for CD accounts carefully to get the best rate possible. Pay attention to the fees associated with retirement accounts. While you may be earning more returns from your investments, hidden fees could nibble away at those earnings. Choose long term savings accounts that fit your time frame. Ideally, you want to have as long a runway as possible to cash in on compounding interest. Don't drain retirement accounts prematurely. In doing so, you could not only end up with a large tax bill, but you'll also shrink your nest egg.